AUGUSTA, Ga. — Let’s start with the cop. Let’s start there because what we saw out of Tiger Woods here on Friday, no matter how riveting and brilliant and enthralling, was what we’ve seen out of Tiger Woods before. Maybe no one was certain they’d see it again, at least not in a major, let alone the Masters, let alone at 6-under, let alone just one shot back of the leaders, but none of it was really, truly new. Not the fist pumps or the putt drops or the gallery roars that hit decibels so loud they rattled all those tall Georgia pines. The cop, though, the officer from the Georgia Bureau of Investigation that was working security detail on the 14th fairway of Augusta National? No, golf hasn’t seen that. Tiger had just struck his second shot on that hole, struck it from the trees along the left side of the fairway. As Tiger walked out to see his shot land up on the green, an overambitious GBI agent came charging up in an effort to control the surging crowd behind Woods. As the agent approached Tiger, though, his left foot slipped on the rain-soaked grass, causing him to go into a baseball slide of sorts. That’s when the agent’s right knee clipped Tiger’s right ankle, bending it slightly and causing Woods to go into a pronounced hop and limp. At that point, all of golf gasped. 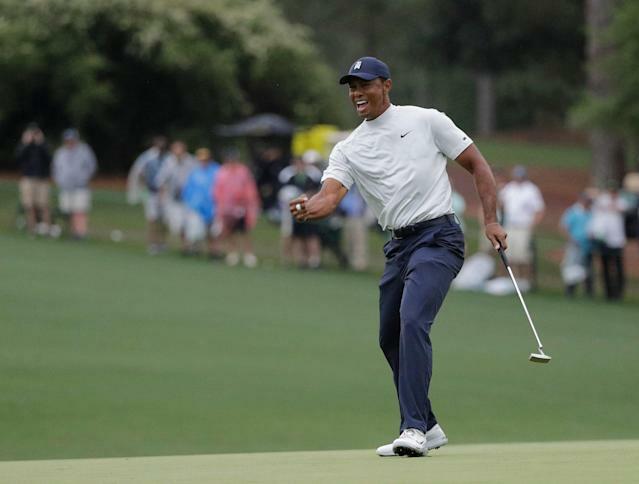 Here Tiger was, back to entertaining the sport and contending for majors at 43 years old, and he might have been taken out by the Augusta National security operation, of all things. The man has survived back surgery, tabloid scandals and prescription med issues only to get wrecked by a cop? Fortunately, Woods quickly found his balance and kept on walking. After a few more ginger steps, he seemed to forget about it. The truth was, he didn’t have time to worry about what had happened. He had a putt to make. He had a golf tournament to try to win. Tiger Woods plays in front of a lot of people because a lot of things tend to happen when he plays the game. Or at least they used to. He has 14 majors, including four here, but it’s been a long time since believing he could slip on another green jacket was anything but an exercise in hope or delusion. Three of the past five years he wasn’t healthy enough to even play — usually just jetting in for the old timer’s champions dinner and then skipping town. As his travails mounted and time ticked, there was little reason to think what transpired here Thursday and especially Friday were truly possible. Then came last summer, and the game began to click again. He finished tied for sixth at the British Open and runner-up at the PGA. Then he won his 80th career tour event. Most importantly, that has carried over into 2019. It’s a log jam at the top — a five-way tie for the lead at 7-under and four more, including Woods, at 6. But at least Tiger is one of the logs. “This is now three straight majors that I've been in the mix and so it's good stuff,” Tiger said. It really is. Woods played brilliantly, and if he had been able to convert any of three very makable putts on 12, 13 and 17, he’d be in the lead. If there was a cause for concern here, it’s that inability to finish relatively short putts flashing as a warning sign. In his prime, Tiger was absolutely money from within 10 feet. It’s part of what made him unbeatable. On Thursday he left those shots out there, although he made up for it with long putts at 14 and 15. They’ll need to because this is one heck of a leaderboard. All five players ahead of Tiger have won major championships. So, too, has Dustin Johnson at 6-under and Phil Mickelson at 4-under, among others. Tiger is counting on experience because at this point, why not? He’s seen it all, especially here. He’s done it all, especially here. When you can shake off the GBI nearly breaking your ankle and promptly drain a clutch birdie putt, then mental toughness isn’t the issue. The next two days will determine that. If nothing else, though, golf is being treated a revival act, an encore that too many had given up on ever occurring again. No one moves the needle like Tiger Woods and so it made sense he was front and center on a circus of a day here — pouring rain, lightning delays, frustrated players and brilliant shots. It played to a massive television audience and rowdy gallery trailing Tiger even as heavy stuff came down for quite a while. And it occurred even as a well-meaning, if slippery-footed cop, nearly took him out.